Elektro was built in 1937/38 by Westinghouse at their factory in Mansfield. He was over seven foot tall and had a vocabulary of over 700 words. 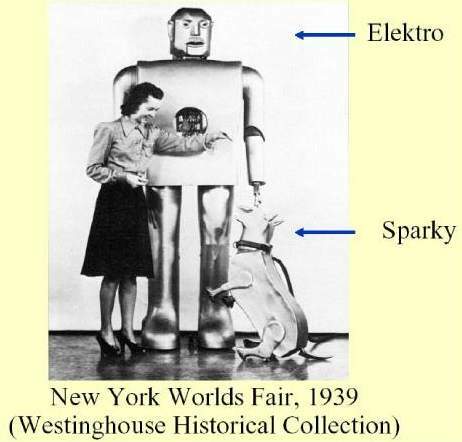 He first appeared at the 1939 New York World's Fair and returned there in 1940 with Sparko the dog, his operators putting on a twenty minute show every hour during the Fairs two summer run. Elektro was retired in the late 50s to be a static display at Palisades Theme Park in Ocean Side, California and after appearing in a few movies was sold for scrap. Surviving he has now been restored by Jack Weeks (2006) (whose father, John, helped create the robot), and is on display in The Mansfield Memorial Museum, housed in the Mansfield Soldiers and Sailors Memorial Building. 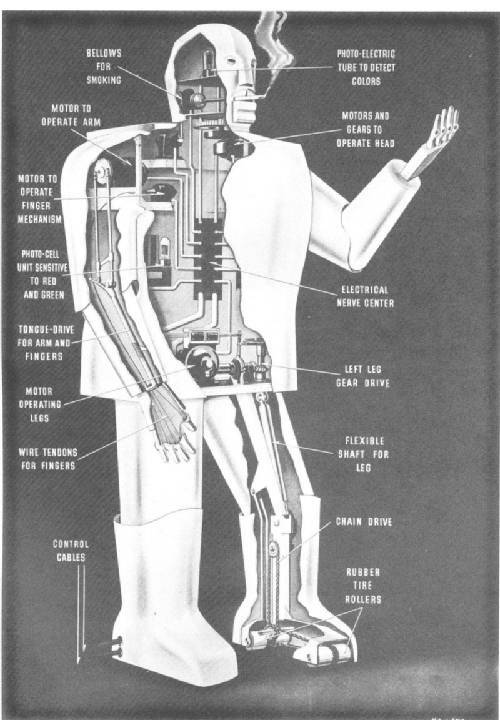 Elektro, one of the most photographed mechanical men, was produced by Westinghouse Electric Corporation in 1939 for the New York World's Fair. Constructed from Aluminium on a steel frame, Elektro was capable of performing twenty six movements and responded to commands spoken into a microphone. each word set up vibrations which were converted into electrical impulses; which in turn operated the relays controlling eleven motors. A series of words properly spaced selected the movement Elektro was to make. Two-word commands started an action. One-word commands stopped it. Four words returned all relays to their normal positions. His fingers, arms and turntable for talking were operated by nine motors and another small motor worked the bellows so the giant could smoke. The eleventh motor drove the four rubber rollers under each foot, enabling him to walk. 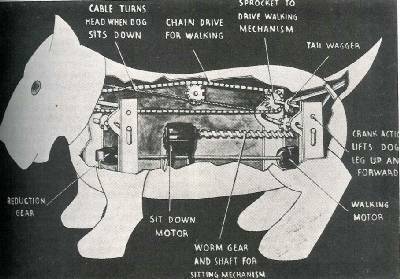 Elektro's faithful companion, the dog Sparko, with two motors, could beg, bark and wag his tail. Note the two photocells, one in the head and the other in the chest, how were they used in Elektro's operation? 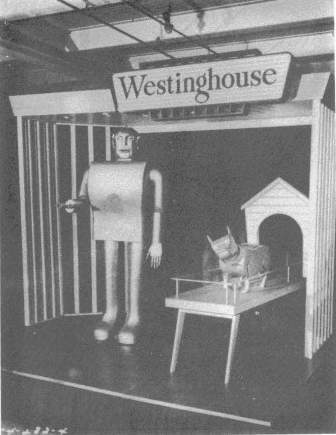 Photophobia, for high illumination levels, should well have been included in a robot dog built (probably by Westinghouse) for the 1939 New York World's Fair. It was designed to home in on visitors by sensing their body heat and "bite" their legs. But, just before the exhibit's opening, it was attracted by the headlights of a passing automobile, and charged out an open door like a four-legged kamikaze and was run over, despite the startled driver's efforts to avoid it!